There is trouble brewing between the city-states of Gujareeh and Kisua. Ancient rivalries, religious differences and old-fashioned greed threaten to snap the fragile thread of peace existing between them. The Prince of Gujareeh outwardly seeks peace but something is amiss. An envoy lies dead, mysterious corpses sprout everywhere and there are rumours of armies building in the north. And on top of this a deadly Reaper, previously considered a mythical bogeyman, may be on the loose. N.K. Jemisin throws us into the heat of The Killing Moon‘s action with barely any time to orient ourselves. From the get-go we plunge into this ready-formed world, replete with vibrant history, authentic religions and all-too-familiar political machinations. The desert region she has created feels intentionally like a doppelganger of ancient Egypt, complete with a time cycle measured in ‘flood years’. Against this incredibly rendered and vivid backdrop people carry on their lives in all manner of familiar ways, familiar but for one trade: the Gatherers. Central to The Killing Moon‘s plot is the rich religious mythos, revolving around the magic inherent in dreams which the Gatherers harvest from those on the brink of death. This mysterious cult approaches those reaching their final hours, by request or decree, and enters their minds under a cloak of secrecy. Once there they shepherd the departed towards the eternal dreamworld, eventually cutting their soul’s tether and returning to reality with a precious harvest of dreamblood. The process is part ritual offering and part shepherding souls towards their goddess but the primary focus remains the harvest. Dreamblood is a powerful substance, capable of all manner of healing and sustenance yet turning Gatherers into addicts who cannot function without a regular personal supply. Its complement, dreambile, shares similarly potent qualities, yet such power can corrupt easily so Gatherers must remain forever vigilant. We follow two such Gatherers, the wise, experienced Ehiru and his eager apprentice and would-be lover Nijiri. At the novel’s outset Ehiru’s gathering goes badly awry, leaving him shaken and in fear of losing his control over his abilities. The incident which sparks his crisis seems intertwined with a Kisuan diplomat, the exotic Sunandi, impelling him to investigate with Nijiri in tow. 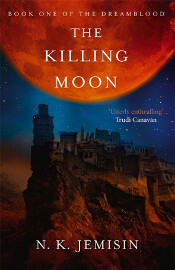 The unfolding action and plot in The Killing Moon are highly compelling, rivalling the best thrillers in the literary world but never losing the fantastic feel of its setting. As well as the cloak-and-dagger political intrigue there is the mystery of the Gujareen temple Ketawa as well as the very physical interaction of Ehiru and Nijiri with their counterparts. Did I mention Gatherers are almost ninja-like in their martial prowess? No? Well now you know. Capable of defeating all but the most elite of opponents they can also send most men to the dreamworld with a brush of their fingertips. Jemisin squeezes every ounce of mileage she can out of these warrior monks and never once does it feel tired or forced. On top of that, once the Reaper’s powers begin to manifest themselves the book takes on a sinister, apocalyptic feel which completely changes its character and refreshes the situation. However it’s the incredible world which makes Jemisin’s book such a riveting success. You’d be forgiven for thinking that she had spent years either researching or living in a real Gujareeh, such is the authenticity n which it is steeped. Every detail is covered, from ritual and decoration to combat and caste system. The religion will seem familiar to anyone who has studied ancient Middle-eastern belief systems, although is never so close as to have been simply plagiarised. Jemisin could have been lazy and simply lifted a patchwork of elements from history and culture but instead has put in the hard hours to build an entirely believable and organic world from the threads which join our own ancient civilisations. The first half of a duology, The Killing Moon is more than strong enough to stand on its own among the very best of its genre. What could easily have been just another fantasy novel cashing in on the Game Of Thrones market instead sets a new watermark in terms of the intermingling of imagination and authenticity. The sequel, The Shadowed Sun has already been elevated to the top of my reading list with her previous works (said to be even better by some) following close behind. If desert-based fantasy, action and political intrigue sound like your bag then you may just have found your new favourite author.